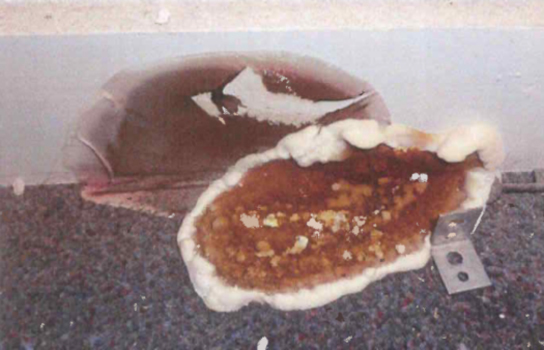 Kenwood were recently called to inspect a property suffering from fungal growth on the carpet tiles. Our Surveyor inspected the property and identified an ongoing plumbing leak which combined with a lack of ventilation below the floor, had resulted in an outbreak of Dry rot. Further inspection of the sub floor identified a severe outbreak. Treatment for this extensive outbreak required the removal and destruction of flooring timbers and joinery along with the removal of wall plaster. Following this removal, the exposed brickwork is then irrigated by drilling the masonry and injecting a fungicidal preservative. The oversite was then sterilised to eradicate the fungal spores. The floor void could not be adequately ventilated and therefore the floors were replaced with concrete.